/EIN News/ -- PORTLAND, Ore., March 12, 2019 (GLOBE NEWSWIRE) -- Truckload freight volumes typically decline on the spot market in February, but the 12 percent drop from January was sharper than usual this year, according to the DAT Freight Index. Extreme winter weather in many parts of the country contributed to the drop in volumes, but February also followed an unexpectedly strong January. Spot market freight volumes dropped sharply in February from an unusually strong January, according to the DAT Freight Index. Extremely cold weather and an early Chinese New Year contributed to the seasonal lull in truckload transportation, but spot freight is expected to rebound in Q2, said DAT. The DAT Freight Index measures change in the volume of loads moved, based on the DAT RateView database of 3 million spot and contract freight movements per month. Spot market freight rates returned to seasonal norms in February. While rates seem low compared to record highs of 2018, the month-over-month decline was not as steep as it has been in the past. Rates are expected to rise in the second quarter, to a June peak, according to DAT Solutions. National average rates include fuel surcharges. Rate information is derived from the DAT RateView database of $60 billion in annualized transportation spending. Shippers accelerated freight movements in January in response to Chinese New Year, which came early this year. The two-week holiday often leads to a lull in overseas trade, and dry van and refrigerated (“reefer”) freight rates and volumes fell throughout the month of February. Volumes rose 3 percent compared to February 2018, however, which signals a rebound to come in the second quarter. These trends were revealed in the DAT Freight Index, a monthly report that tracks demand for truckload freight transportation. DAT re-indexed the metric based on data collected in DAT RateView, based on $60 billion in annual transactions and an average of 3 million loads moved per month. Last year’s rates were elevated following the start of the electronic logging device (ELD) mandate. As a result, this February’s national average spot market rates did not compare well to the previous year. 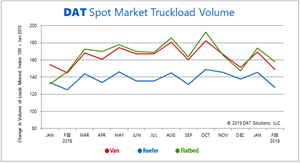 Compared to January, though, the national averages for spot market van and reefer rates lost a much more modest 7 cents per mile, while flatbed rates were unchanged, month over month. “February is typically the slowest month for truck freight, but spot market volume is holding up well this winter compared to previous years,” said Mark Montague, DAT’s senior industry analyst. “We expect trucking activity to gain momentum in March and throughout the second quarter,” he added, noting that spot market rates typically peak in June. 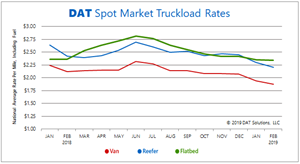 For contract carriers, volume slid lower for van, reefer, and flatbed freight, compared to January. As a result, shipper-to-carrier direct rates edged down month over month, but prices were up sharply compared to February 2018. Many carriers renegotiated their agreements with shippers last year, but the new rates had not taken effect yet in February. The year-over-year increase also includes a higher fuel surcharge, which is tied to the retail price of diesel. For more than 10 years, DAT’s North American Freight Index has provided monthly reports on spot market truckload demand, based on posting data from the company’s load board service. Beginning in February 2019, the Index is based on actual load counts from DAT RateView, with an average of 3 million freight moves per month. Rates cited also derived from DAT RateView. Spot market information is based on transactions arranged by third-party logistics (3PL) companies, while contract volume and rates are arranged between shippers and carriers, with no intermediary. DAT operates the largest truckload freight marketplace in North America. Transportation brokers, carriers and industry analysts rely on DAT for market trends and data insights derived from 256 million annual freight matches and a database of $60 billion in annual market transactions. Services include a directory of companies with business history, credit, safety, insurance, and company reviews.